Mom has been using this homemade laundry detergent all year and giving bottles of it to my sister and I (and anyone else who asks). It cost her around $12 for a year’s worth of laundry (or so I remember), even with giving stuff away, and she has leftover ingredients to cut the cost for this year. I’m gonna make a batch for myself after I move into my new digs. 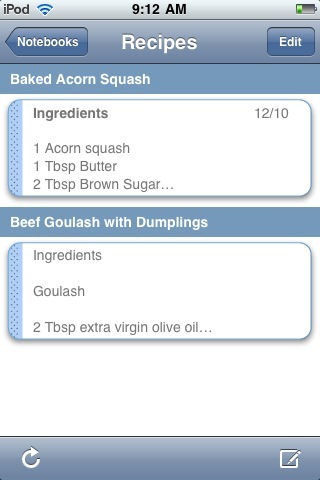 Use your Google Notebook and the free Gnotes app to cull together a custom recipe box on your iPhone or iPod Touch. I’ve been playing with a iPod Touch from work for the past few weeks. One of the first things I did was dig around for interesting and useful free apps that don’t require constant 3G connections to work effectively. One thing I knew I needed was a functional note-taking tool that would sync the notes with my computer(s), and that’s how I stumbled upon Gnotes. Basically, this application syncs with your Google Notebook and pulls the text of the notes to the iPod/iPhone. 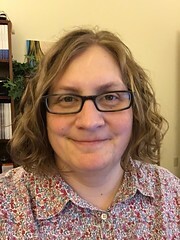 The first thing I did with it was type out the words to some choral pieces I needed to memorize, and after I got comfortable with the interface, I began thinking of other things I could do with it. One of the apps I first searched for was something to collect, store, and display recipes I wanted to use. There are plenty of free and pay apps for recipe collections, but I didn’t want fifty bajillion recipes to sort through, and I don’t have a wireless router at home, so I needed something that could be used offline. Then it hit me — why not use my Google Notebook for this, too? One down side to this versus using a printout or paper note card is that you can’t see the whole recipe in one screen, so you’ll need to make sure you scroll down far enough to have everything visible you need for that step in the process. You also might want to edit the recipe instructions to include the amount of each ingredient (if it isn’t like that already) within the text, to avoid scrolling up and down each time to check for quantity.